Bom Jardim, the enchanting paradise. ​What more do I need to say. Bom Jardim, meaning beautiful garden, is THE most beautiful undiscovered part of Brazil. Where a decent amount of Brazilian tourist avoid the overcrowded and commercialized Bonito, there`s only a handful of foreigners making a pit stop at this hidden paradise. 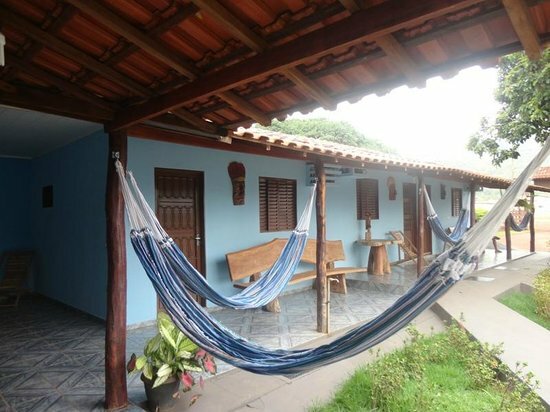 A perfect addition to your visit of the Northern Pantanal and Chapada dos Guimares. Trust me, you won`t regret it. Oh and…it`s a secret.. so please don`t tell anybody else. Perfect place to enjoy the sunset. Bring a bottle of wine, juice or a nice cold beer. Pick yourself one of the benches and enjoy the view over this (artificial) lake. The palmtrees in the lake make a dormitory for dozens of macaws, egrets and other bird species. At the end of the day all these hardworking beauties will return to their homes after a long day of collecting food. It`s a true spectacular site, topped up with the colorful background of the descending sun. ​Just a 10 minute walk out of town, this is a true hidden paradise. Buy your ticket at an agency in town (Agencia Bom Jardim is recommendable or let in include in a tour package through Bom Jardim Nobres tours). Walk to the western part of town. The last shop in town on your left side will be an electronic store. Show your voucher inside the store at the counter and you`re free to enter. Even though the name means sad river, the only thing sad about this river is when you miss out on it. The water is crystal clear with a blue golden glow. The riverbanks are beautifully overgrown by forest, causing a beautiful soft sunlight on the water. Together with the dozens of different fresh water fish, including the fresh water stingray! This will definitely be one of the most picturesque snorkeling tours you`ve ever done. How to organize this tour? This tour has to be done with an authorized guide and therefore booked beforehand. Those happy to have a Portuguese speaking guide can book through Agencia Bom Jardim. Those preferring an English speaking guide/interpreter better book through Bom Jardim Nobres tours. The snorkeling takes a bit less than an hour. You don`t need to be a good swimmer nor to have a good condition. You`ll be hooked up with a lifejacket and sandals, both keeping you floating. The soft stream will take you to the finish. All you have to do is look around and enjoy the underwater ballet. The `enchanted kingdom`, a perfect place to relax and enjoy the `tranquilidad` of nature. About 1.5 kilometers of wheelchair friendly trails through the forest makes this attraction extremely suitable for family activities. But also couples or single travelers looking for a place to roam around and refuel with natural peace, this is the place to go. The trails lead to various hidden pools in the forest, home for several big fresh water fish. Those looking for a refreshment can also go snorkeling in the river or crab a drink at the bar at the entrance. How to organize this tour? This tour has to be with an authorized guide and therefore booked beforehand. Those happy to have a Portuguese speaking guide can book through Agencia Bom Jardim. Those preferring an English speaking guide/interpreter better book through Bom Jardim Nobres tours. The snorkeling takes a bit less than an hour. You don`t need to be a good swimmer nor to have a good condition. You`ll be hooked up with a lifejacket and sandals, both keeping you floating on the water. The soft stream will take you to finish. All you have to do is look around and enjoy the underwater ballet. Thought you`ve seen it all? Thought you`ve had enough of snorkeling? 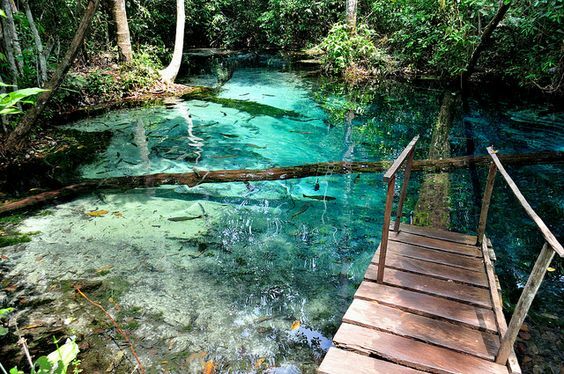 Wait till you`ve seen Aquario Encantado, the enchanted waters. Imagine a fairy talel blue pond in the middle of the forest, monkeys jumping around in the treetops and birds singing there calming songs. I`m not going to explain any further, this one you`ll have to see with your own eyes. The tour takes around 2 hours. The snorkeling part takes around 45 minutes. You don`t need to be a good swimmer nor to have a good condition. You`ll be taken to the beginning of the trail by a train truck. From there it`s around 800 meter walk to the pools, where everybody will be given their time to enjoy this charming site. From there it`s a 120 meter walk to the starting point of the snorkeling. You`ll be hooked up with a lifejacket and sandals, both keeping you floating. The soft stream will take you to finish. All you have to do is look around and enjoy the underwater ballet. 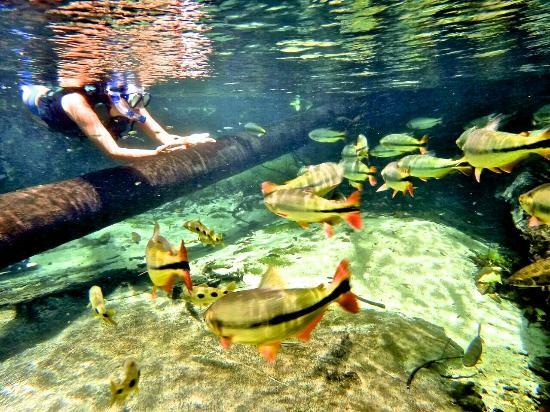 Tip: combine this tour with snorkeling at Reino Encantado, the enchanted river. Both are just a 10 minute drive from each other and very well worth it. Forgot to bring your own lunch? A buffet at Aquario Encantado costs around R$ 40. A bit more flexibity in the budget? The rooms at Pousada Bom Jardim are really nice. There`s a big garden with hammocks, chairs, veranda`s to chill out. There`s also a fish pond and numerous plants and flowers to enjoy. Bom Jardim is a very simple town. There`s just dirt roads and a couple of shops. You`ll find no ATM`s in town, so bring enough cash. There`s one pharmacy, but to ensure your medical needs, bring essentials. Also cables, adapters, SD-cards and other electronics will be hard to find in this town. Make sure everything is up and running and you`re not in the need of any replacement. There are busses leaving at all sorts of hours on that stop in the city of Nobres with all sorts of final destinations. The city of Nobres itself is 60 km from Bom Jardim. Buses to Nobres will be around R$ 65. From here you`ll be obliged to hitchhike to Bom Jardim. The closest airport is located in Cuiaba. Here several national airlines offer flights throughout the country. From there take the bus combined with a hitchhike, book transport with a tour of hire a car. A rental car might be a good option for those traveling as a couple or in a group. Several car rental places can be found in Cuiabà. Please take into account that the roads around Bom Jardim are nothing more than dirt road and most of the time in bad state. Be careful driving around and return the car cleaned. The rental offices will look for any excuse to put you up with a massive repair/replace/cleaning fee. Planning on doing several tours? Booking a tour package including transport might turn out cheaper…. There are tour agencies that can provide private air-conditioned van service transportation from Nobres with a package tour, but keep in mind that is going to get really expensive! Plus not available at all times as during raining season only vans or 4 x 4 will be able to cross the dirt road. 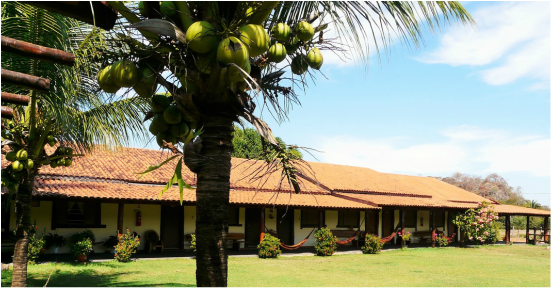 *At the moment of writing Pousada Bom Jardim is building a campsite just outside of town. The campsite will have showers, toilets and a biological restaurant with fresh food. Ask at the reception of Pousada Bom Jardim if the spaces are ready to use.